Summer is here and kids are celebrating! It’s time for a break from school and the weather is great for playing outdoors. Busy parents everywhere are wondering how to keep their kids occupied during the summer break. We have a few suggestions that might help. The number of possibilities when it comes to art projects is just about endless! 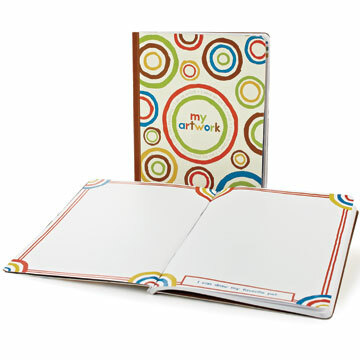 Bring out the inner artist in your child and create a treasured keepsake at the same time with the My Artwork Journal from the Compendium Kids collection. No more wondering what to draw – each spread in this journal has a suggested theme to inspire your child to create a picture. STAEDTLER ergosoft aquarell watercolor pencils are a fun medium to experiment with. You can draw with them just like pencil crayons and then use a wet paint brush to blend and wash the colors to make a watercolor painting. When you’re creating art using a wet paint brush you’ll need a heavy-weight paper to prevent buckling. Clairefontaine’s watercolor pads have the ultimate paper to pair with the aquarell pencils. 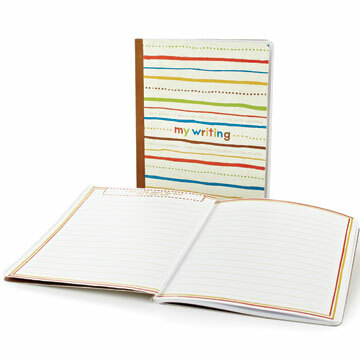 For the young writer, the Compendium Kids collection includes My Writing Journal. Suggested topics such as “I can write about someone who lives in our neighborhood” or “I can write about my grandparents” encourage your child to write about how they see the world. It’s super fun to read these stories again years later! Now would be a great opportunity to introduce a child who enjoys writing to the world of fountain pens and high quality paper. Many authors step away from the world of technology and write some of their best work using an old-fashioned fountain pen and paper. 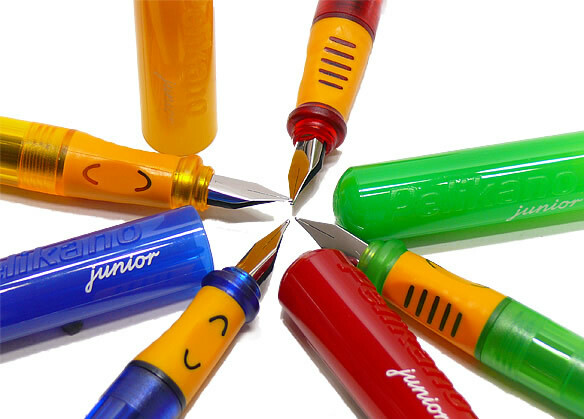 A good choice for a first fountain pen for a young writer is the Pelikano Junior. It has an ergonomic grip that guides proper finger placement and the rounded medium-broad nib is easy to write with. 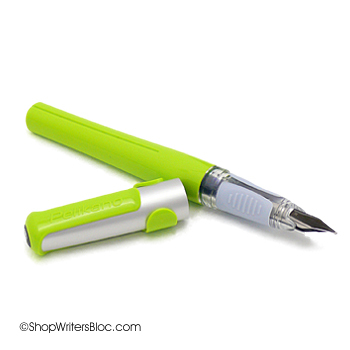 The Platinum Preppy disposable fountain pen is very inexpensive, comes in two nib sizes and seven colors and is another good choice for a beginner fountain pen. Don’t forget to buy some ink cartridges too! Clairefontaine is the ultimate paper for writing with fountain pens since it has a super smooth finish and handles fountain pen ink very well. 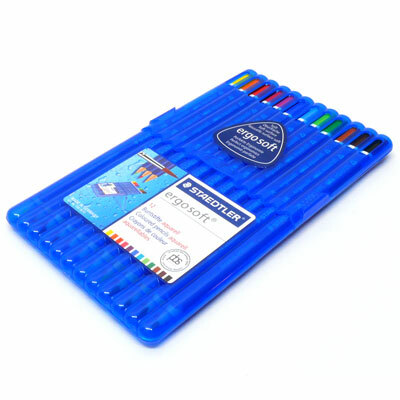 Try browsing through the clearance Clairefontaine on our website for deals on notebooks that can be used for kids. 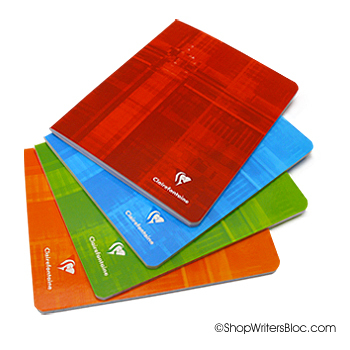 Or try out either of the low-priced large or medium size side-stapled and ruled with margin Clairefontaine notebooks. 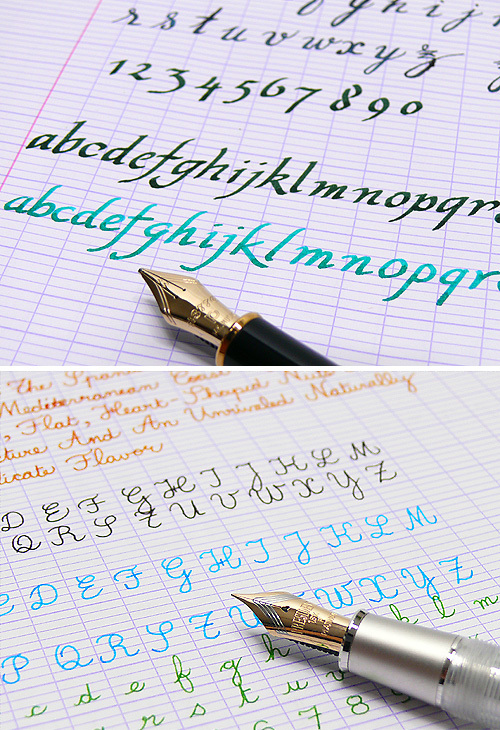 Besides writing poetry or stories, a fountain pen and nice paper can be used to learn or practice French cursive handwriting or calligraphy. If you’re wondering what French cursive is, you can take a look on Google images to see many samples and learning guides. Since cursive handwriting is not included in the curriculum of many schools this is something that students may want to learn at home. To find inspiration and learning guides for calligraphy Google images provides a huge variety of designs! To learn French cursive handwriting or calligraphy it can be helpful to use French-ruled paper since it has grid lines that are quite useful for cursive writing practice. 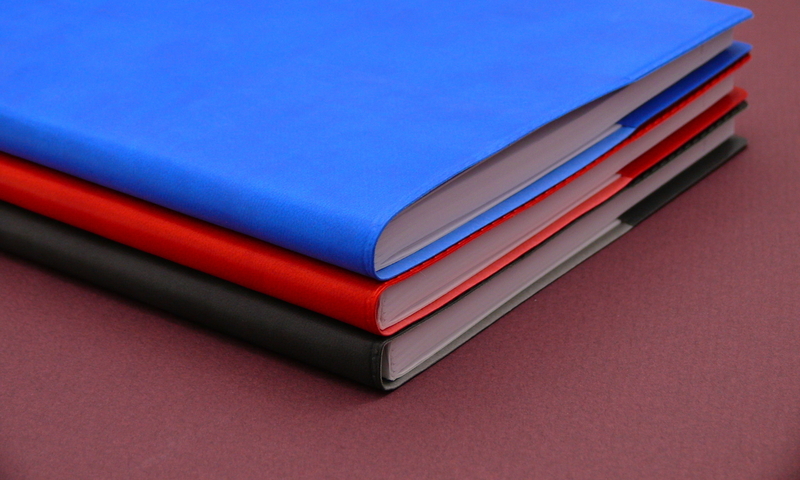 Clairefontaine paper comes from France and has several notebooks with French-ruled paper such as their inexpensive medium-size staplebound notebook. Our blog post “What is French-Ruled Paper?” will help you better understand what is special about this paper. A couple of good beginner fountain pens to use for learning French cursive handwriting are the Pelikan Pelikano with a fine nib or the disposable Platinum Preppy with a fine nib. When choosing a beginner calligraphy pen keep in mind that the smaller nibs are easier to write with but are best suited for smaller writing. 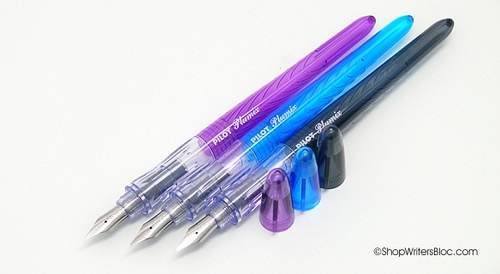 For regular size handwriting the Pilot Plumix calligraphy pen is a great choice. 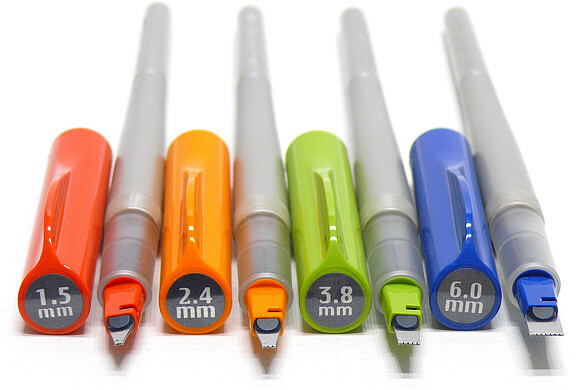 Pilot Parallel Calligraphy Pens come with four different sizes of nibs ranging from 1.5mm to 6.0mm and can be purchased individually or as a set. Once again, don’t forget to buy some ink cartridges or you’ll soon be running out of ink! If a child has brothers and sisters or maybe a few neighborhood friends to play with, good old-fashioned board games and card games are a fun social activity. We have discovered from our own experience that if kids like video games chances are very good they will also love board games and card games! All you have to know is how to count to play a crazy action packed game of Halli Galli. 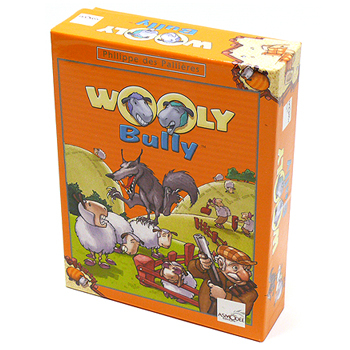 For kids around 6 or 7 years old a story telling game like Once Upon A Time, or a tile-laying game like Wooly Bully will be fun. For kids 8 and older, try the beautifully illustrated story telling game Dixit, the zany rule-changing card game Fluxx, or Turbo Taxi a fast-paced puzzle game. Teenagers that are sci-fan fans will like Race For The Galaxy, other teens will enjoy Shear Panic the strategy game with Wallace & Gromit-like sheep, or the ever-popular Settlers of Catan. If your children haven’t tried playing Eurogames yet, get them one and they may end up being the most popular kids in the neighborhood this summer! What are your kids doing this summer? We would love to hear about their favorite games, art, pen and paper projects! All you need to know to play this game is A B C. Simple as that. 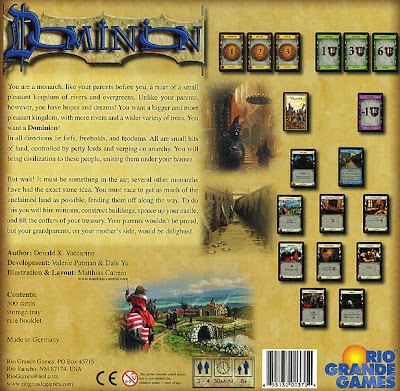 Dominion from Rio Grande Games is a simple card game that has the potential to get extremely complicated. There are 5 different types of cards: Treasure, Action, Victory, Attack and Curse. Using these cards, you create your own "dominion" (otherwise known as your deck). 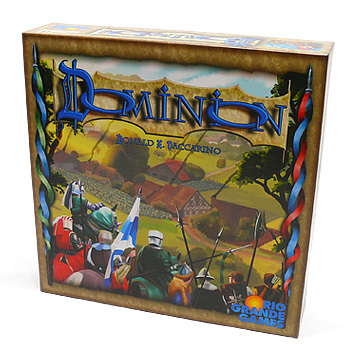 The object of the game is to utilize the resources allocated in your dominion to gain the most victory cards. The game is laid out with 10 different sets of Kingdom cards, as well as Treasure cards (Copper, Silver, and Gold), Victory cards (Estate, Duchy, and Province) and Curse cards. Your Kingdom cards are those selected from your collection of cards to put into play. Kingdom cards can be purchased and played during your turn. Each game you play can be different depending on what cards you choose to lay out. One of the reasons this game is so great is that you never play the same game twice! Changing one Kingdom card can completely change the strategy and outcome of the game. Kingdom cards can be chosen at random or strategically. So how do your ABC’s come into play? Each player starts off with 7 Coppers (worth 1 monies) and three Estates (worth 1 victory point). At each turn, each player must move through three phases: Action, Buy, and Clean. Each card has a different action and effect on your turn. A: Action Phase. Play an action card. (Action cards are purchased from the selection of Kingdom cards.) Your turn will go according to what your action card specifies; your action card can give you more actions, give you more money, allow you to draw more cards etc. In some instances action cards can also be attack cards. Attack cards are used if you are feeling especially nasty and would like to take your opponents treasure cards, give them curse cards, remove cards from their hand etc (essentially "attacking" the other players). Because you do not have any action cards on your first move, your first play will start off at the buy stage. B: Buy Phase. Using the collective treasure you have (some treasure will come from your deck and some may come from action cards), each player is given one buy, meaning he can purchase one thing from the Kingdom card selection or he can buy more money. If your action card gives you additional buys you may purchase more than one thing. No matter how much treasure you have, you can only purchase one card unless you action card says otherwise. (Each player always has one buy, if your action card says +2 Buys, you now have three buys). C: Clean Phase. When you have completed your buy, all of your cards used on that turn go into your discard pile. This includes the cards you just purchased, the cards played, and the remaining cards in your hand. The discard pile can only be used when the pile you draw from is depleted. Discarding your cards completes your turn and you draw five more cards (essentially starting off with a brand new hand). Easy right? Yes, however, when someone plays an action card that gives them more action, things can get complicated. +Actions are great when you have a plan. Action card after action card can be played if permitted. There is no limit to how many action cards you can play as long as you have cards to permit additional actions. One person can play all the action cards in their deck and accumulate 30 treasures – but their turn would have lasted half a century. However, if you can do this and have more action cards to play – DO IT, use everything on the table to your advantage. Although the point of the game is to gain the most victory points, victory points are useless at the start of the game because they cannot be used. You do not want to fill your hand with cards you can’t use. One mistake many people make is to buy as many victory cards as they can as soon as possible. However, with every draw you only get five cards, you are handicapped if you have a hand of 3 victory cards and 2 treasure or action cards in your hand. The trick is to accumulate enough treasure to buy the larger victory cards such as the Province, this ONE card is worth SIX victory points. So instead of having six Estate (worth 1 victory point) cards in your deck you simply have one Province card. Needless to say the Province card is highly coveted (and very expensive). Having few cards with high value is much preferred to having lots of cards of little value. Curse cards are negative points, they count against you at the end of the game. 1 curse card = -1 victory card. The game ends when all of the Province cards are gone or when three sets of Kingdom cards are gone. When you notice the Kingdom cards are going fast or the Province cards are almost gone – now is the time to stock up on victory cards because the game is about to end. At this point, you want to buy any victory cards you can afford (however, at any point in the game, if you can afford to buy a Province – DO IT!). When the game ends, organize your deck, total your victory cards, subtract your curse cards, and declare a winner! Expansion packs are also available. Expansion packs are great for re-vamping your pool of Kingdom cards or raising the stakes. The Prosperity expansion pack includes treasures that are worth up to 5 monies, called a Platinum card. Prosperity also includes the ever so coveted Colony card. This card is worth 10, yes, 10 victory points! Grab your friends, change up the game, and rule your Dominion! I have to say that there is nothing quite like spending a warm summer evening sipping iced tea, eating watermelon, and playing a strategic agriculture-based Eurogame with family and friends. Being a city girl through and through I was a bit slow on the uptake of the concepts of farming, building, and harvesting in Agricola, but once I got into the groove of the game it was fun and engaging. Basically in Agricola you and your spouse have settled in a little wooden house on a piece of land, and your goal is to cultivate the land, raise animals, have kids, and make some home improvements. Each of these elements is worth victory points; moreover, you receive a penalties if you don’t have some of everything. The game works in phases, each one allowing you opportunities to take new actions (plant a field, acquire livestock, build a fence etc.) and each phase ends in a harvest when you will be expected to reap the fruits of your labor and have enough food to feed your family. The game ends at the end of the final harvest phase, and the player with the most victory points wins. It was highly entertaining to watch the strategies my friends and family tried to use. For example, my younger brother decided that it would be beneficial for him to expand his house and have more kids so that they could help "work" the farm (the number of actions you can take on your turn directly corresponds to how many family members you have) but he was always in a wild panic come harvest time because he would not have enough food to feed his giant family. His stress increased as harvest came sooner and sooner with each phase of the game, but he was always able to barely scrape by. I hope that this is not a reflection of how he will provide for his real family in the future. Overall, we all enjoyed the game. It was the first time playing for most of us, so from explanation of the rules to declaration of the winner it took a little over 3 hours to complete the game. Hopefully the next time we play we’ll be able to take faster turns and the game will move along more quickly. As the manufacturer recommends, this game would be best for ages 12+ due to it’s pace and the amount of reading involved. Summer is almost here and so is the peak travel season. One of my favorite vacations is driving to the Oregon coast and renting a beach house that we share with friends. We usually bring several games to play that add to the conversation and enjoyment of our relaxing weekend. Our friends also bring games so we have the chance to play something new. Games can be a fun way to help you pass the time while travelling on a plane or train. Once you arrive at your destination they can be played on a picnic table by the lake, on a blanket by the campfire, or if it happens to rain, inside your tent or hotel room. Here are a few suggestions for games you might like to play this summer. 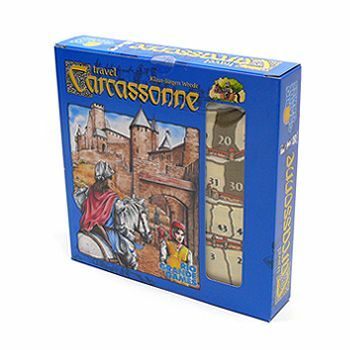 Carcassonne Travel Edition by Rio Grande Games is a down-sized, easy to carry version of the original game Carcassonne. The scoring track is cleverly printed on a cloth sack which is also used to carry all of the game pieces. This award winning game is not to difficult to learn and is enjoyed by a wide variety of personalities. Cards are a classic travel game due to their size and the ability to play them in small places. For a fun, new twist on cards Fluxx by Looney Labs is a fast moving game with ever-changing rules. 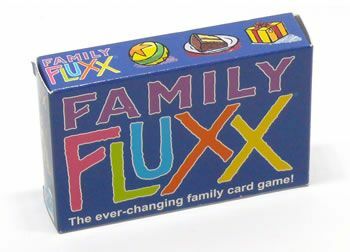 Fluxx games are usually short, lasting anywhere from 5 to 30 minutes. Fluxx comes in 3 variations – Family Fluxx, Eco Fluxx and the original Fluxx. 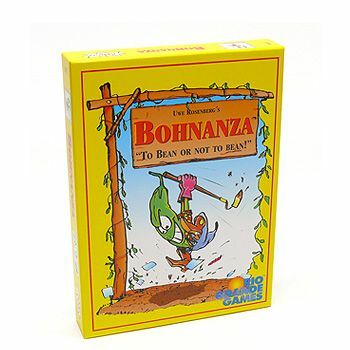 Another popular card game that we once observed being played on a train is Bohnanza from Rio Grande Games. This game is all about planting, trading, and selling beans to earn as much gold as possible to win the game. Your bartering skills will be put to the test! 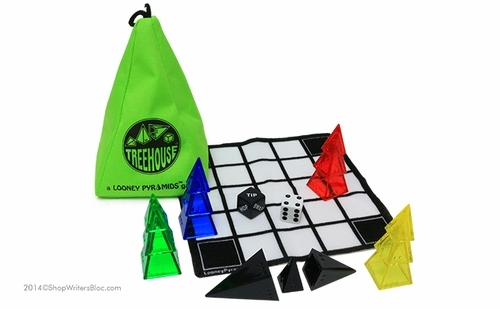 For something a little more three-dimensional but still compact, Treehouse by Looney Labs is a game of abstract strategy with a simple objective that can become challenging very quickly. This game with its colorful pyramids has over 200 variations of how to play so far, and new ways to play can be created on your own. What games will you be playing on your summer vacation? 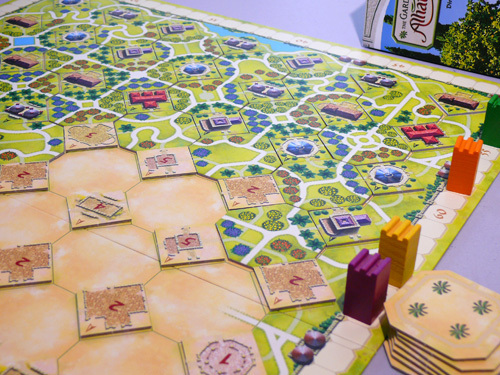 I found that The Gardens of The Alhambra by Queen Games is the perfect game to play at the end of the day when I want to unwind and relax. It is not too intense or competitive and you can engage in pleasant conversation during the game without feeling like you are distracting yourself or the other players. The rules are not too complicated and can be learned in about 10 minutes. This is a good, simple game to play with family and friends and you can enjoy it even if you are not a "board game geek". 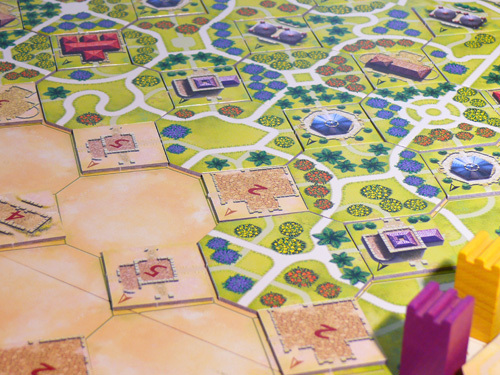 During the game players put down tiles on a board to create a visually soothing and beautiful garden complete with winding paths and four different colors of trees. Since lime green happens to be my favorite color, I particularly liked the overall light bright green color of The Gardens of the Alhambra game pieces. The idea of the game is to lay down tiles to maximize your points and minimize the points of your fellow players. Each player is represented by one of four different kinds of trees – orange, lemon, lavender or palm. If you can plant more of your own trees than other players trees around the highest point markers this is of great advantage, but you don’t want too many of your own trees since tree variety also multiplies the number of points found on the markers. The player with the most points when the garden is finished wins the game. Good for 2-4 players, 10 years old and up (this game would also be suitable for younger players if they know basic multiplication and math skills or are playing with someone else who does). Playing time is about 45 minutes to one hour. If you like games that involve tile placement you might also enjoy playing Carcassonne by Rio Grande Games or Metro by Queen Games.